At the higher levels (i.e. 2600 and up), most players hide their serve because most umpires simply are not enforcing the rules. The main rule in question is, "It is the responsibility of the player to serve so that the umpire or the assistant umpire can be satisfied that he complies with the requirements of the Laws." Many players have learned to just barely hide contact from their opponent, but they do it so quickly and subtly that umpires, sitting off to the side, aren't sure if they have hidden the serve - and instead of warning and then faulting the player for not fulfilling the rule quoted here, they let it go. And so those who cheat are rewarded. There are always exceptions, such as world #6 Vladimir Samsonov, who never hides his serve. How good would he be if he did so? But he plays against hidden serves regularly, and developed his game before hidden serves were illegal, and so can return them effectively. Before, illegal hidden serves was mostly a problem at the highest levels. Now it's spreading to the cadet levels. It's survival of the fittest, and the "fittest" are those who win, and more and more these are the ones who hide their serves. The problem is you cannot learn to return hidden serves unless you practice against them on a regular basis for a long time. (It's not easy learning to read spin from the way the ball travels through the air and bounces on the table, and to do so quickly enough to react properly.) And you can't do this unless your practice partners use them. So the only real way to teach players to return hidden serves is to teach them to all to hide their serves. Plus, even if you learn to return hidden serves, you have to use them yourself if you want to compete evenly. The problem is that this is cheating. But unless they illegally hide their serves, players cannot compete with their peers who hide their serves. I've watched far too many matches where two players seemed evenly matched, but one player gets clobbered because his serve returns go all over the place - in the net, off the side, straight up or off the end - because they simply can't return hidden serves since they haven't practiced regularly against these illegal serves. It's frustrating to coaches who train up-and-coming juniors. What do we tell them? To cheat? Or to accept that all their training is wasted as far as competing with their peers who are willing to use these illegal serves? Here's a 1997 album called Momus Ping Pong, which features a table tennis oriented cover, including a large gorilla with a ping-pong paddle. Here's a video of the album (4:33). 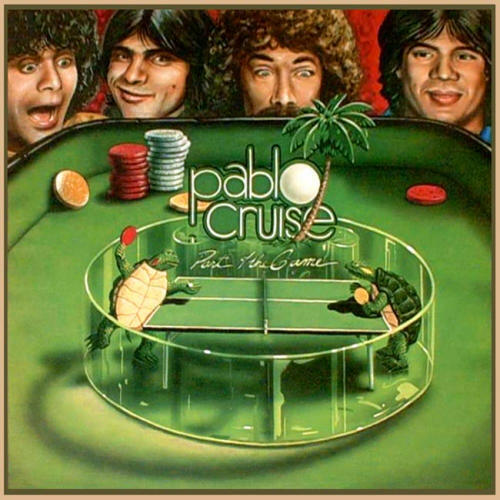 Here's a 1979 Pablo Cruise album called Part of the Game, with turtles playing ping-pong on the front cover. Here's a larger picture of the cover. Here's a video of the album (3:47). Anybody want to review these "table tennis" albums? At least that was the headline of a story in Sunday's Washington Post Outlook section! Friday was Day Ten and the last day of our second MDTTC two-week camp of the summer. While working with the beginners (mostly age 8-10), I brought out "Froggy," a large and very realistic rubber frog, which I put on the table for target practice. We divided the group into two teams of four, and while I fed balls with multiball, they took turns trying to hit it. Team A won over Team B, 21-17. I brought it out several more times as the kids seemed to take great pleasure in hitting the poor frog. We ran a tournament for most of the players, but I again took the beginners separately, as they weren't really ready for a tournament. Instead, I brought out two bags of candy - hard candy and Hershey's chocolate kisses - and spread them on the table. I spent much of the afternoon feeding multiball as the kids tried to knock them off. When they did, they got the candy! This was MDTTC's last camp of the summer. Our next camp is our Christmas Camp, Dec. 26-31. Yes, the two weeks of camp has turned my back into a battlefield tourist attraction on a par with Gettysburg. If anyone can pull the twisted sword out of my back, I will make you king of England. Do you (or your students) look forward to practice sessions? Why or why not? Those who do usually improve; those who don't, don't. (Well, usually.) Players who can't wait to get to the practice session are where future champions come from. If you or a player you coach doesn't seem to look forward to practice sessions, perhaps it's time to add some variety. Push their limits - have them try more advanced shots, even if you don't think they are ready for them yet. It was held this weekend in Vancouver. Here is the web page with results. This 15-minute video is about the best action-packed table tennis video I've ever seen, compiling many of the best points ever played. After watching this, you'll either be ready to beat the best Chinese or you'll be spraying (attempted) world-class shots all over the court. 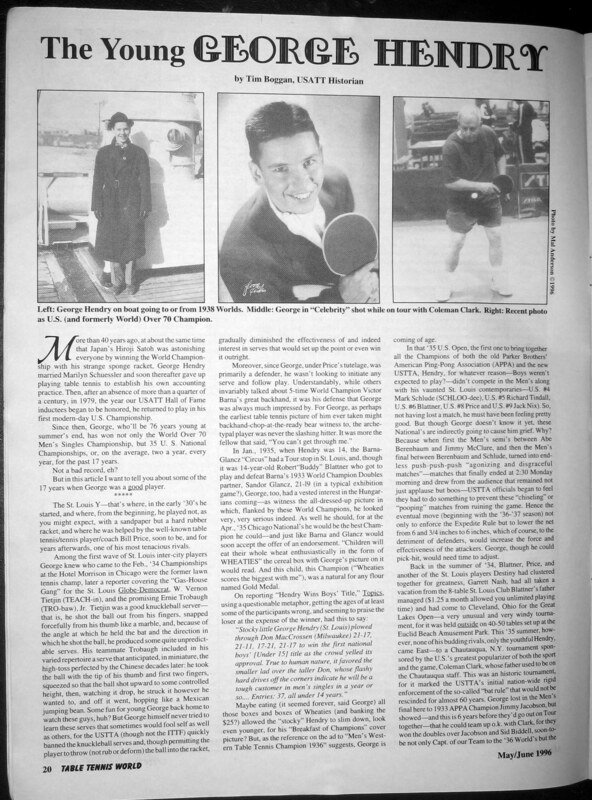 Here's Tim Boggan's article on George Hendry (table tennis legend who died last week), from the May/June 1996 issue of Table Tennis World. 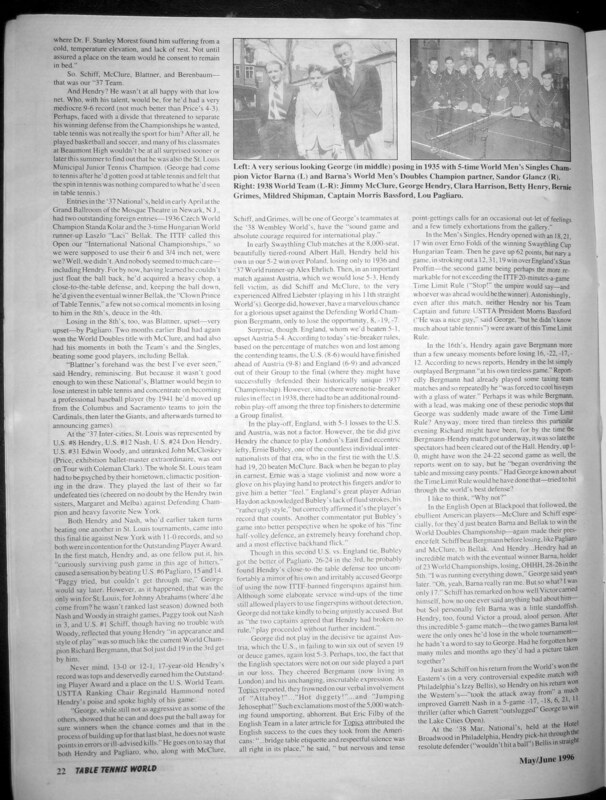 You'll have to zoom in to read the text. It includes some very nice pictures. Friday's blog, where I wrote about Hendry, including my Ode to George Hendry from 1992. Today's focus was on footwork. When I announced that, the groans could be heard in China, where the sonic vibrations caused massive nationwide lets. Of course, all table tennis drills are footwork drills - we just don't spend much time reminding players. One player said he wanted to know how he could "move up a level." Talk about coincidence - one of my favorite articles I've written is "How to Move Up a Level"! 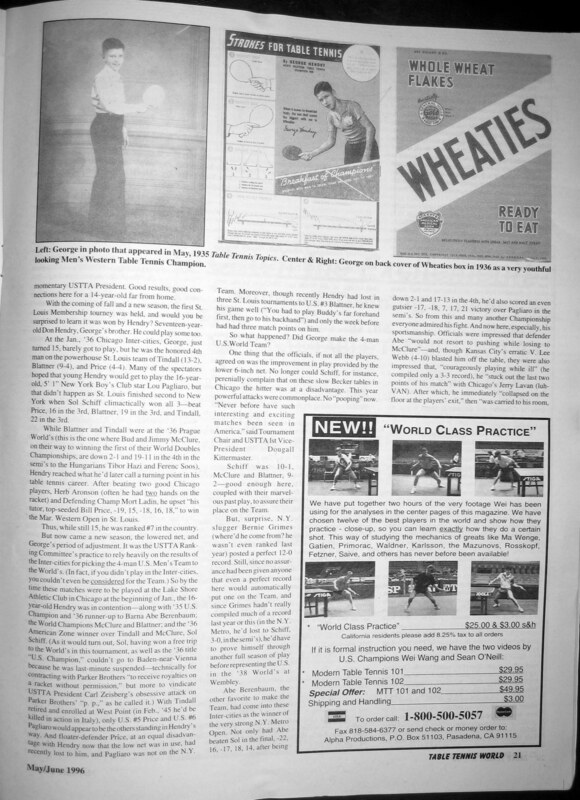 I pointed out the article in his copy of Table Tennis Tales & Techniques. I also introduced him to With Winning in Mind: The Mental Management System, by Lanny Bassham, one of the best sports psychology books around. During break, the kids played "napkin poker." If the coaches won't let you play for real money, why not? Camp ends tomorrow - final report will be on Monday. Serving and Gripping and Wrist, Oh My! Here's The Daily Lesson/Ping-Pong (1:46), a nice table tennis primer by table tennis coach and sports psychologist Dora Kurimay. Here's the text under the video: "Chances are, you either grew up with a ping-pong table in your basement or played a few less-than-friendly games somewhere else. In addition, it's likely you've never had a lesson from a pro (and sorry, watching "Balls of Fury" doesn't count). That is, until now, courtesy of former Hungarian champ Dora Kurimay. Tap on the video above to learn proper footwork as well as the perfect grip. That should be more than enough to lift your game out of the cellar." What do Barack Obama, Susan Sarandon, Lil Jon and Lindsey Vonn have in common? 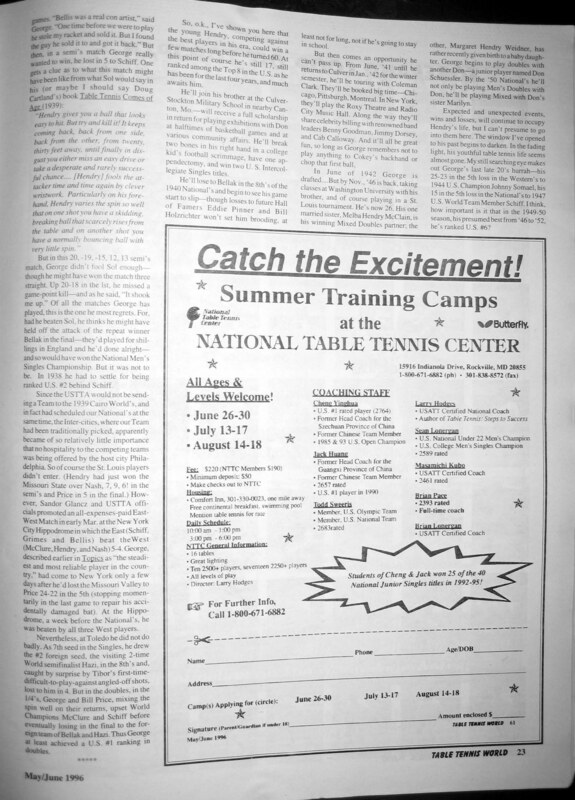 Yes, table tennis - here's the article! Here's a new first-hand account. USATT Hall of Famer George Hendry, one of the last of the great hardbat players, died Wednesday, Aug. 17, a few days short of age 91. Here's his Hall of Fame bio, and a picture (he's on far side). I've known him for 30+ years, so it was a shock to hear the news. After he won Over 60 and Over 70 at the USA Nationals one year, and George Brathwaite had won Over 40 and over 50, I staged a picture of the two of them jumping into the air and giving each other high-fives. After he'd won the 1990 World Over 70 Singles Championships, I wrote the following Ode to him. Do you think at your age that is right?" A few more dents shouldn't hurt it, I've said." While the other side's good for a ruse." Pray, how do you manage to do it?" Which often meant running through walls!" Be off, or get kicked through the table!" Today we focused on backhand attack. In the demo, I did the "hard-soft" drill with Raghu Nadmichettu, 2400 player & coach. We had the rally of the week, where I alternated regular backhand drives and all-out backhand smashes, and he blocked back at least 15 smashes before I finally won the point with a net-ticking smash. We were going to play games the last 30 minutes of the session, but five junior players surprised me by asking if they could do more multiball training. So while the others played Brazilian Teams or King of the Hill, we did more multiball coaching. Scott Boggan - back in action? Yes, Scott Boggan, 1981 U.S. National Champion, USATT Hall of Famer, brother of fellow champion and Hall of Famer Eric Boggan, and son of Hall of Famer Tim Boggan, is entered in the New York City Open! He's one of the 258 entries (so far) in the tournament, Aug. 27-28, entered in the Open, Over 40, and Over 50. I expect to be there (just coaching), and look forward to seeing him after all these years. He's a retired New York firefighter and active pro poker player (really! ), and has two kids who are actors, Taylor and Zak. Yesterday's session went really well, one of the smoothest. The focus was on forehand looping, though the new players worked on basic forehands and backhands. There were a lot of breakthroughs as new players figured out forehand and backhand drives, more advanced new players figured out looping and spin serves, and advanced players learned world-class shots. Light bulbs were going off over players' heads like fireflies. Especially rewarding were two players who spent much of their break practicing serves, and three others who asked if they could do extra multiball after the session ended. I put in extra time to work with these five juniors. They were the more "serious" players, and out of that group will come the breakout stars. Quote of the day: "I played really well because of the coffee." -David Bachman, age 13, after drinking coffee from Dunkin' Donuts that morning. I noticed that a number of players in the camp smash (poorly) with a sudden jerky motion. This comes from trying to contract every muscle at the same time at the last second, creating a spastic shot. Instead, try a more relaxed, smooth motion and longer backswing. You still want a rather sharp motion, but not a herky-jerky one. Key to smashing is always using the same backswing, bringing the racket back to the same exact spot, over and over. If the ball is high, you then raise the racket after backswinging as part of a smooth, continuous motion. (If you raise the racket during your backswing, when you come to a stop you'll be slightly off-balanced, plus you'll have a different backswing for every shot of a different height.) Then just stroke through the ball, shifting the weight through the ball, first from the legs, then waste, then shoulders, and then a vigorous snap from the arm rotating on the elbow. Contact should be relatively flat, but with a slight upward motion, relative to the direction you are hitting the ball, especially if smashing backspin. This varies from player to player, based on playing style, level, and financial situation. Loopers need a grippy surface, and so often change more often then other styles. Higher-level players also change more often as they want the sponge to be both grippy and bouncy. Rich players tend to change more often because they have more money. So how can you tell if your rubber needs changing? Wash off the surface with a table tennis cleaner or something similar. (Some use a watered-down soap mixture.) Then examine the surface - is it fading? Rub a ball on it - is it as grippy in the middle as along the side? If there's a noticeable difference, then you might want to change. The surface is usually the first part to go, so this is the primary test. However, some of the more recent "breakthrough" sponges that mimic glued sponge seem to lose their bounciness faster than other types, and so you might want to change those when the bounciness starts to drop. That's a more subjective judgment; you should be able to tell if it's starting to die. When I was playing competitively, I generally changed my forehand sponge every month, my backhand sponge every two months. (I'd often time this so I'd have new sponge for tournaments, especially on the forehand.) The reason is that I looped a lot on the forehand, and so needed a grippy surface. On the backhand, I mostly hit and blocked, and so didn't need to change it as often. Others might not need to change as often as I was playing six days a week. If you play only twice a week, then to match me, you'd only need to change every three to six months. California Cadet Star Ethan Chua gives a short report on his training in China. 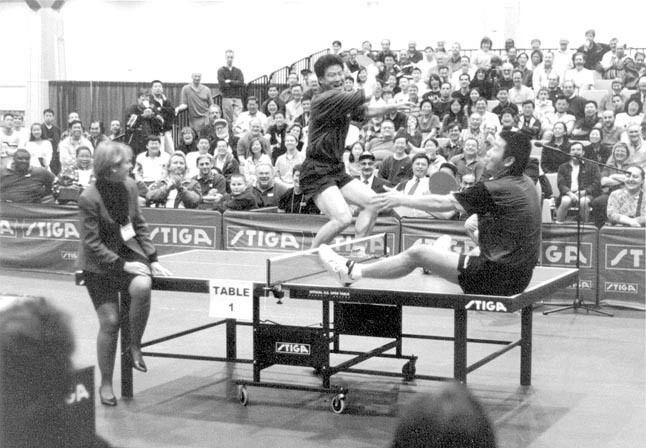 Perhaps the greatest table tennis rally ever. I'm supposed to get an automatic email letting me know whenever someone comments on this blog or the forum. This morning I received about 50 emails about such comments going back over a week ago - for some reason they were delayed. So I spent this morning deleting spam comments and reading over other comments I'd missed. I left the latter emails as unread and will respond to them probably tonight. Sorry about the delay and the numerous spam that polluted the site this past week. Feel free to comment on these blog entries. There's a surprisingly high ratio of readers (300+ per day) to comments. The day went pretty smoothly with few casualties...other than my ongoing back problems. Three beginners this week, all about age 8 or 9 - and all three picked up the basic forehand and backhand very quickly. I've spending much of our breaks working with players on serves. It's painful to my back when I do forehand pendulum serves - the most popular serve and my primary serve - but I have to do them over and over to demonstrate, alas. But the players are picking them up quickly. The ones who work on serves during break are the most dedicated players, so the extra time (and pain!) spent on them is worth it. I've been showing players how to "do the journey," that serving trick I blogged about previously where you serve from your forehand side (assume both players are righties) with a forehand pendulum serve, and make the ball bounce on your backhand side, cross the net, hit the opponent's forehand side, and curve around and bounce into a box placed in the opponent's backhand side. (You can do this with other serve, including from the backhand side with the reverse type of sidespin.) Another trick is the come-back serve, where you serve a high, short backspin ball so that it bounces back onto your side. These are both great ways to practice putting spin on the ball and controlling it. I gained 2-3 pounds last week by eating Chinese food for lunch every day. This week I'm living on peanut butter & jelly sandwiches (one per meal) and carrots for lunch. Yes, it's outdoor table tennis in the streets of Denver. And why not? I once did an outdoor exhibition with Scott Preiss on a street in Colorado Springs during some local fair. It was windy, and just as we started, it began to rain. It wasn't heavy, so we continued, though most of the crowd had taken cover. About five people with umbrellas stayed to the bitter end with us. Here's comedian WC Fields playing table tennis in the 1939 movie You Can't Cheat an Honest Man (2:33). At 1:27, he smacks a woman in the back to knock the ball out of her mouth. That was me in disguise. Can you write The Book on Your Game? As noted in previous blogs, one of the favorite games we do in the camp is to put ten paper cups on the table in various configurations, and see how many a player can knock down with ten shots. Unfortunately, on Friday this degenerated into "cup wars." During break, several of the kids took the whole stack of cups (about 50) and created a huge pyramid on the table they planned to knock down by hitting it with ping-pong balls. Another kid walked by and knocked it over with his hand. The others were angry, but couldn't really do much about it. They created another pyramid, and again the same kid came over and knocked it down. Then he wanted to join them in creating a new pyramid, but they wouldn't let him. (Gee, I wonder why?) So the kid grabbed a bunch of the cups. Then we had various chase scenes as the others tried to get the cups back, and it ended up with some punching and a lot of shoving. I finally had to intervene, and took the cups away from the destructive kid - which led to a total meltdown. "I just want to play with the cups!" he wailed. It's easier teaching a beginner how to beat the world champion than trying to explain to a screaming 8-year-old that they wouldn't let him play with him because he kept knocking down their cups - and he vowed he'd keep knocking them down. Alas. Someday I'll ask Stellan Bengtsson if refereeing cup wars is part of table tennis coaching. On the brighter side, a 7-year-old girl couldn't hit one shot in a row when she started on Monday. By Friday, she was smashing winners. Week One was a great success - and Week Two'll be even better! For beginners, one of the best things they can do to develop hand-eye coordination in table tennis is ball bouncing. We have them bounce the ball up and down as many times as they can on their forehand side. It's very difficult for a typical 7- or 8-year-old, though by age 9 or 10 it becomes much easier. After they master this, we introduce the next step: ball bouncing on the backhand side, which is a bit more difficult for most players. When they master that, then we have them alternate, bouncing on the forehand and backhand sides. We also have advanced players join in this, and have competitions between the beginners and advanced players. The advanced players have to alternate hitting one on their racket's surface, and one on the edge of their racket! I've taken on many of the beginners with this handicap, and it's often a close battle. Try this out and see how many you can do. I usually average about ten shots before missing; my record is 31. But if I practice, I think I can break that, and so should you. One of my students in the camp we're running is looking to change his racket and sponge. I knew basically what he wanted - he loops just about everything on the forehand, both hits and loops on the backhand - but to help with the decision-making I had him do two things. First, he tried out every racket and sponge he could from players at the camp and club. (One problem with that is you often have to try out sponge on an unfamiliar racket, and so aren't sure how it'll play on your own racket.) Second, we researched them online at the Table Tennis Database. It's a great place to find equipment reviews! When you're starting out, it's a good idea to really learn what's out there by trying out as many rackets and sponges as possible. Once you find the right equipment for you, I urge players to stick with it unless their game changes or there's a real equipment breakthrough (which happens about once every five to ten years). I maintain a number of web pages, mostly for table tennis. Here are the main ones. TableTennisCoaching.com. 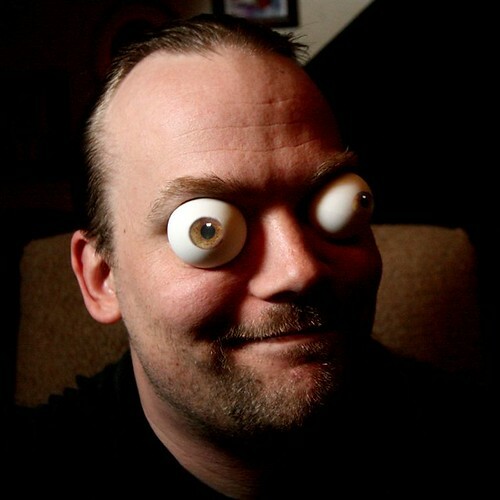 You are currently reading my blog here. Explore and enjoy! My personal table tennis site. This started out as my table tennis coaching page. It includes links to a complete listing of my published works (currently 1275 articles in 121 different publications), my table tennis book collection (204 books), and lots more. Celebrities Playing Table Tennis. Over 1200 pictures of over 700 celebrities playing table tennis. If you haven't been there, what's wrong with you? It's a lot of fun to find your favorite celebrities playing pong! Tim Boggan Table Tennis. This is where you can learn about and buy Tim's History of U.S. Table Tennis books - there are now eleven. I do the page layouts and photo work, and created and maintain the web page for him. My Amazon page - where you can buy copies of my books Table Tennis: Steps to Success and Table Tennis Tales & Techniques. My Science Fiction & Fantasy page. 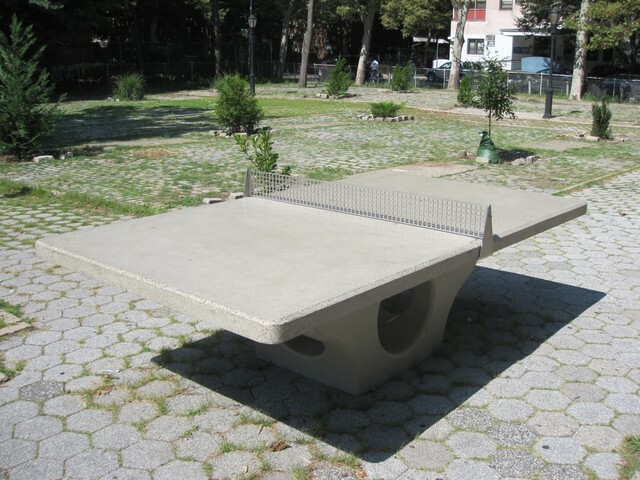 Outside table tennis, I write SF and fantasy. I've sold 51 short stories (11 cover stories), and have two novels making the rounds of publishers and agents. Yesterday we focused on footwork. Actually, we do that every day, since - as I regularly remind everyone - all table tennis drills are footwork drills. I gave a short talk on footwork, and on the progression from rote drills to random drills. I also gave them my standard "Are you a tree or a squirrel?" talk. Quote of the day: one kid (about 9) was doing a drill that involved stepping around his backhand corner to hit forehands. He looked awkward and kept losing his balance. I came over, but before I could say anything he looked at me and said, "I can't do the drill. I'll step on my drink." I looked down, and realized the reason he was so awkward and was losing his balance was because he was trying not to step on his drink, which sat on the floor on his backhand side. I moved the drink off to the side, and his improvement was immense. Sometimes I'm more babysitter than coach. There are two kids in the camp who interact like fire and gasoline. I think I spend half my time telling them to stay away from each other and the other half tuning out the constant cries of, "Larry, Larry, look what he did!" We have one 7-year-old kid who's a walking hazard. He's oblivious to others when he plays. When he goes to pick up balls, he constantly walks right into other player's backswings, and keeps getting hit. I keep reminding him not to go near anyone who's playing, but he can't seem to remember. 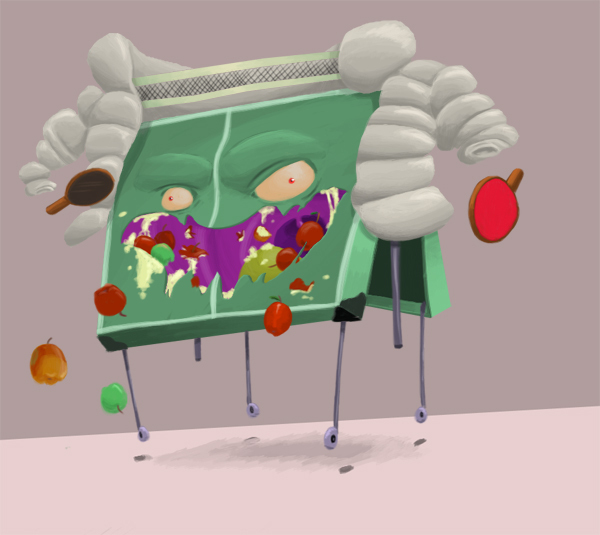 Yesterday I had the single greatest idea ever in the history of table tennis. I've figured out a way to bring in major table tennis sponsors for tournaments - with the Broken Bat Open! (©2011 by Larry Hodges!) It's very difficult to get major sponsors in table tennis - there just isn't enough money in the sport to make it worthwhile for big sponsors. But here's a way to change that and turn table tennis into the high profit-making sport that sponsors crave! All we have to do is add one simple rule for tournament play: whoever loses a match must break his racket. Yes, you read that right - he must snap it over his knee, burn it, put it through a wood chipper, or whatever, the exact method doesn't matter as long as the racket is destroyed. Here's why. Suppose a player enters an average of slightly more than three events per tournament. Since the large majority of players do not win an event, we'll assume that the player loses in an average of three events per tournament. Since most events are round robin, let's assume he loses an about twice per event. That means he will have to break six rackets. Let's assume we're running a four-star tournament with 200 players. That's 1200 rackets broken (and replaced) per tournament. Let's assume the average racket costs about $70. (We're ignoring sponge for now, and let the player take the sponge off his racket and put it on the new one.) Let's assume the distributor pays about $20 for that racket, and so makes a $50 profit each time they sell a racket. (They will be the sole distributor allowed at the tournament.) That's a profit of 1200 x $50 = $60,000! So we go 50-50 with the distributor - they put up $30,000 prize money sponsorship, and make $30,000 profit, and we're all winners! Here's a nice article by U.S. National Junior Champion and Men's Singles Finalist Peter Li on training in China. Yes, sometimes our sport gets a little twisted and seems to be going to the dogs, which is discouraging to us eager beavers, but if we stick to more concrete things and stay above water, we can meet and find devilish ways to develop our sport, and then someday we can all crow* like a rooster. *Needed: picture of a crow playing table tennis. Yesterday's focus was on the backhand attack - smashing, drives against backspin, and backhand loop. To develop the backhand smash (where you lengthen the backswing and/or use more wrist), a good drill we taught is the "hard-soft" drill, which really should be called the "hard-medium" drill. The players hit backhand to backhand, with one player alternating hitting one medium-hard, the other hard. The other player plays steady. To develop the backhand attack against backspin, we introduced a drill for intermediate to advanced players. The entire drill is done backhand to backhand. Player A serves backspin. Player B pushes it back. A backhand loops or drives. B blocks. A chops. (This is the part where beginners have trouble.) B pushes. A backhand loops or drives, and the drill continues. We also focused a bit on doubles play, primarily the basics: serving low and short, hitting toward the person who hits at you (or even to his side so he gets in the way of his partner), and moving in and out rather than sideways, which takes you out of the point. We've been running competitions to see how many cups a player can knock off a table in ten shots. Alex, an eight-year-old near beginner, set an astonishing record when, out of the blue, he knocked all ten cups off with three perfect forehands! Kudos to David Varkey, who's been volunteering as an assistant coach throughout the camp to accumulate the 30 hours coaching needed for his ITTF coaching certification. He should achieve it on Friday. David attended my ITTF coaching seminar in April. Loop or Stop the Loop? Starting at the intermediate level, most playing styles focus on either looping or controlling the opponent's loop. Better players can do both. Players who loop often spend a lot of time developing both their loop and ways to get their loop into play. How often do you work on controlling the opponent's loop? How do you do so? Some ways include effective pushes (either long, deep, low, heavy, and disguised, or short); quick pushes and blocks so opponent doesn't have time to react; angles (all shots); effective blocks (quick, consistent, deep, and low; move the ball around, change the pace; and often go to the opponent's strong side first so you can come back to the weak side, most often the backhand); or just attacking first - though you can't assume you'll always attack first and so still need to handle the opponent's loop when he attacks first. At the advanced levels, you can handle the opponent's loop by counterlooping or even chopping, though the latter is primarily for defensive players. Here's an article on table tennis as therapy for children with Asperger's. Find yourself a dagger and heat it over a fire. Have someone stick it in your back. Have that person twist it back and forth all day. Welcome to my world. As noted in previous blogs, I plan to take six weeks off after the two-week camp here ends on Aug. 19. I'll still coach, but I will have others do my hitting for me. I was toying with still doing multiball, but that's what I'm doing mostly at the camp, and, well, see my note above regarding a dagger, fire, and twisting. We focused on the forehand loop. Some common problems I saw were not dropping back shoulder against backspin; muscles too tight (need to think of them as rubber); moving forward while stroking, with the head moving toward the table, instead of rotating body in a circle (as if there were a pole going through your head); not pulling with the non-playing side (to increase body rotation and torque); and going for too much speed instead of spin, i.e. not grazing the ball enough. One 7-year-old girl who didn't seem happy to be there the first day made friends with another girl her age, began to learn the strokes, and suddenly is all-enthused. Her parents came by to thank us, telling us that table tennis was all she talked about now. The "cup game," where we place cups on the far side of the table and the players get ten shots to see how many they can knock down, continues to be highly popular. (We end each session with games.) Usually we put them in a bowling pin formation. Yesterday we stacked them in pyramids, so that one shot to the base could knock most of them down. The kids loved that, so that's now our "default" formation. The surprise of the day was when I introduced "around the world," and the kids couldn't get enough of it. I would feed the balls multiball style, and the kids would each hit one shot, then run around the table as the others hit their shots. When they missed a certain number of shots ("lives," as they quickly named it), they were out. We handicapped the beginners, giving them extra lives. Every time we finished a game, they begged for more. They were pretty exhausted at the end, and probably slept well last night. One of the players in the camp, 13-year-old David Bachman from Philadelphia, asked if I would mention him in my blog. I said no. Can a ping-pong club really pop? They are in South Florida! To modify Technical Leaflet T3, The Ball (B.3 Size conformity); only applying to balls not made of celluloid. The minimum diameter of every ball must be at least 39.50mm 40.00mm and its maximum diameter must not exceed40.50mm 40.60mm. The sample mean average diameter, i.e. the mean of the average of the maximum and minimum diameters for each ball, must be in the range 39.60-40.40mm 40.00-40.50mm. Values below 39.25mm 39.70mm or above 40.75mm are considered in our calculations as outliers. Perhaps the ITTF is right to ban celluloid ping-pong balls. After all, they are dangerous, as shown here by Marty Reisman, care of Scott Gordon, in this 74-second video.